Well a few moments ago I ran to the polls and made sure to vote, especially on Prop 2. 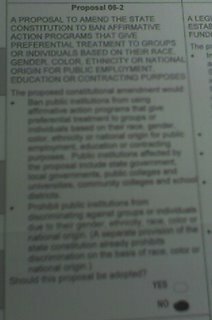 There are a number of other important issues on the ballot as well. I meant to post this earlier, but with about 7 hours left in the polls if you’re looking for a cool voters guide, my friend wsoftheart has posted one here. On a bigger note, my boy called the Hussein verdict and its potential for gaining GOP support… we live in a tricky place. Speaking of tricky, really computer voting machines, why am I not suprised? And lastly, the only thing more ridiculous the youtube video of Connerly endorsing the Klan’s endorsement of Proposal 2, is Zarko’s defense/revision of Connerly. 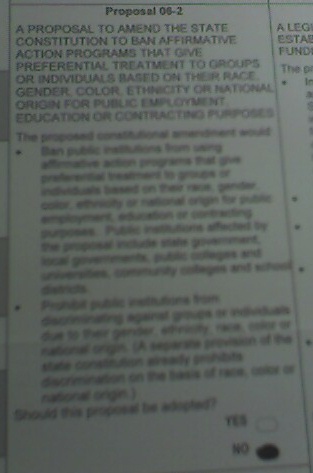 And one last thing, why do I feel like the nation has not even really noticed Proposal 2 is on the ballot in Michigan? I guess I must be one of those non-Michigan residents who has paid attention to this proposal and as to how it will affect other AA programs across America.